This spectacular May morning in Rocky Mountain National Park everything just fell into place. The night before a storm had come through the park covering the higher elevations with fresh snow. At sunrise, the storm was in the processing of clearing and conditions were great for photography. As I rounded the trail, a herd of elk was busy grazing in the meadow. I setup at a small seasonal pond and watched as the sun illuminated Stones Peak in warm light. 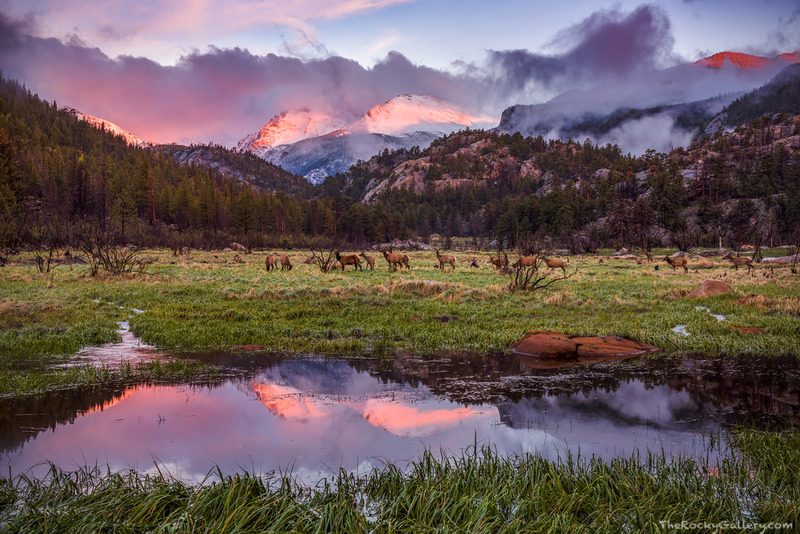 To have the elk remain in the meadow, the mountains bathed in warmed light and a perfect reflection resulted in one of my most memorable and favorite mornings in Rocky Mountain National Park. Photo © copyright by Thomas Mangan.